I spent a lot of the weekend writing letters. I was inspired to get out one of my typewriters for my responses, but I also had a number of postcards to return. Sometimes, depending on the model of the machine, you can get a postcard to feed through, but the portable I was using hates thicker papers. My solution is labels. I use regular ol' white address labels all the time in my mail art. So instead of using them to make a blank space on an envelope, I just roll them through and type my message there. Two to three labels is the sweet spot for most regular sized postcards. You can affix them horizontally or vertically. I like to put a piece of paper over the typed labels before I rub them down to affix them to the card. That way, I don't smear the ink. More process pictures are available on Instagram. Now, one Instagram commentor says that they were told at the counter by a clerk that postal regulations state that ANYTHING stuck on a postcard means it has to be sent at letter rate postage. This is one of those rules that I hem and haw on. I'll maintain that labels aren't stickers and risk it. I can't count how many postcards I've received with address labels affixed. Plus, I send handmade mixed media postcards all the time without problems. It's all part of the mailing fun. If it's heavy or weird, I like to add extra postage, but some typed labels? I'll do the postcard rate. Of course, I ALWAYS put on my return address. They can send it back if they wish. That's why I love the blue mailbox, no judgement. And no misinformed clerks either, which has happened to me. My absolute favorite is when they pull out the guide for mailing and my pieces pass all their tests (because I have one of those guides in my house). Got any postcard typing tips to share? Thanks to member Else for sending in these typewriter repair shops located in Illinois and Indiana. If you have any other shops you want to add to this list, let us know! P.S. Always be sure to call first. Some of these places may have closed or may no longer be accepting machines for service. 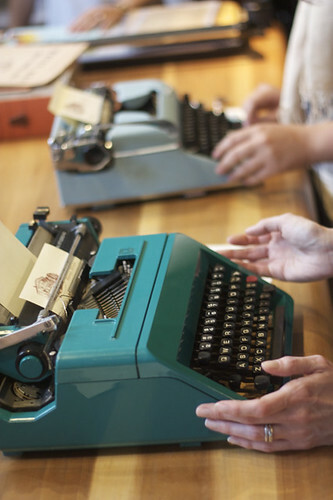 If you didn't know already, I'm sort of obsessed with typewriters. I'm always looking for new ways to write with them. There are a lot of different machines out there and even though they might appear the same at first glance, I get a thrill everytime I find a slightly different font or design. I love the variety available in what some people would think was the same every time. One of the things I've discovered that's out of the ordinary for typing is colored ribbons. Oh sure, there's black and there's also the black and the red. But did you know there was green, and orange, and pink and blue? Why, there's even purple ribbons out there! I first learned of colored ribbons from a Typecaster I follow. 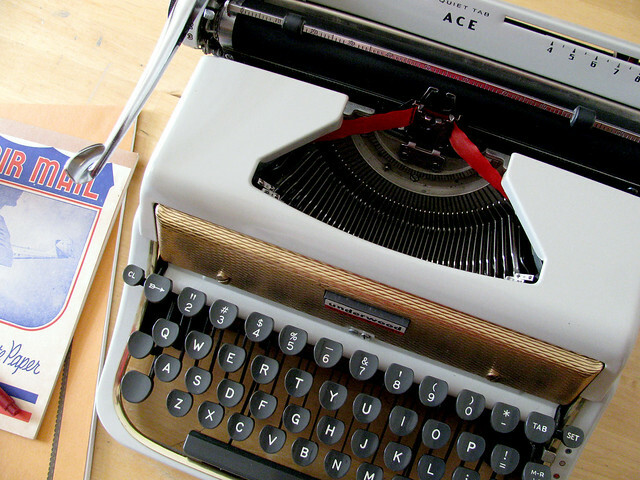 (Typecasters are people who blog by typing and then scanning in their typed entries.) He traded me a purple ribbon for some stamps way back when and gave me the information of a ribbon wholesaler. Unfortunately, I wasn't able to make heads or tails out of the wholesaler info and just went back to my regular ol' red/black beribboned life. But then, on the magic world of ebay, I noticed there are sellers of all sorts of colored ribbons. They're all on "Buy It Now" and around $13 each, less if you buy in bulk. That's double what I normally pay for a regular ribbon, but I think it's worth it for glorious color. You can search for a ribbon for your particular machine, but most will take a standard 2" spool. All I did was search for "color typewriter ribbon". 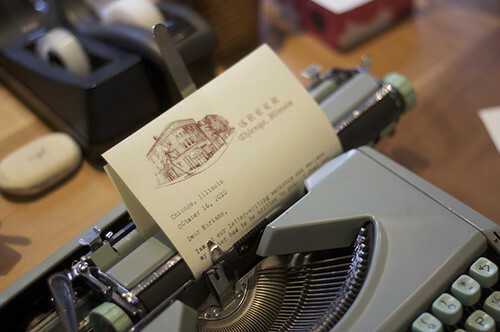 As a reminder, I'm leading a typewriter cleaning and service workshop at the West Town Library tomorrow at 6:30PM. RSVP is required and there may not be any slots left. If there's enough demand, I may run the workshop again. Feel free to bring in your typewriter and I'll give it a look, but my skills are pretty basic. P.S. And I happily announce the winner of our final giveaway. The winner of the Olive Box giveaway is comment number 18: Magdalena. Please email us your member number and address straightaway to claim your prize. When we had our social at Pieritz Bros., the owner John had his video camera with him. Good fortune saw a visit by typewriter and vintage enthusiast Bradley Paul and he held an impromtu typewriter tour in addition to typewriter instruction for a young social attendee. Kathy and yours truly can be seen at the end of the video along with other L.W.A. members typing away. If you weren't there, take a look at what you missed. 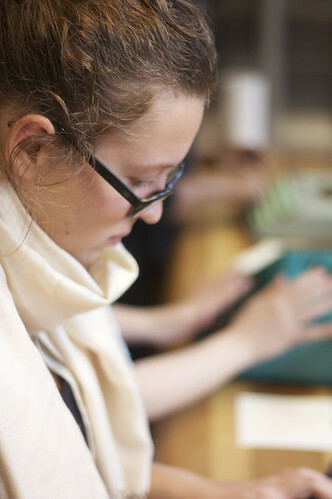 We plan to visit Pieritz Bros. again in the fall and hope to have an even more type-tastic time. 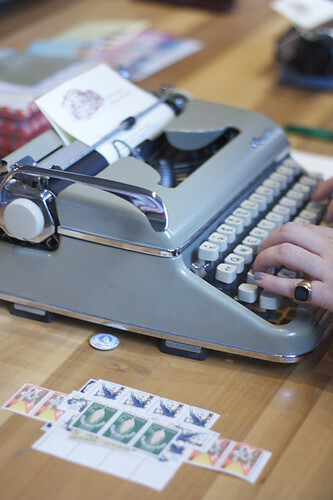 We will be having a typewriter cleaning workshop at the West Town library from 6:30-8PM on Thursday, July 11th. I'll show you how I clean up my machines and change a ribbon. It is FREE, but you must RSVP as there are limited slots available. You can R.S.V.P. at 312.743.0450 or register in person at West Town Library. P.S. EDITED because of things moving around, et cetera. 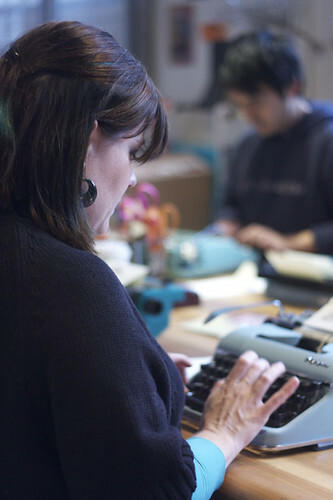 I promise Kathy will get those typewriters listed for sale soon. We took our show on the road last weekend to the Mini Maker Faire in Urbana, IL. We took with us a flock of pigeons, a store of stationery and a brigade of typewriters. All these things combined to make us a hit success at the fair. Our booth was full of eager letter writers all day. A special thanks again to the Appleton Coated company for their sponsorship. The Conqueror paper they sent us is "like buttah" in the typewriters. I even went so far as to print it in color to mimick the MAKE magazine logo. It looked so nice that people could not believe we were giving it away for free. Jealous of all the fun these guys are having? Remember to join us at our next social for Atlas Obscura Day, tomorrow, Saturday the 28th, at the Read/Write Library. You can get your hands on some of that super nice Conqueror paper in a brand-new commemorative design for the day. A ticket is only required IF you want the special L.W.A. membership card. As always, we are hosting the social for free and donations to Read/Write Library are welcomed. P.S. A little pigeon told me that this social is also an Elsewhere Philatellic Society stamp window. Please bring your passport to be stamped. Visas will also be available upon providing of an S.A.S.E. From the industrious bloggers at Boingboing, comes this gingerbread typewriter. It is 100% edible; even the ribbon is made of rice paper. Made by the amazing Patti Page of Baked Ideas, this is definitely center piece worthy. Right on and Write on! 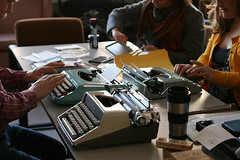 Thanks to everyone who came to the letterwriting workshop on Saturday! 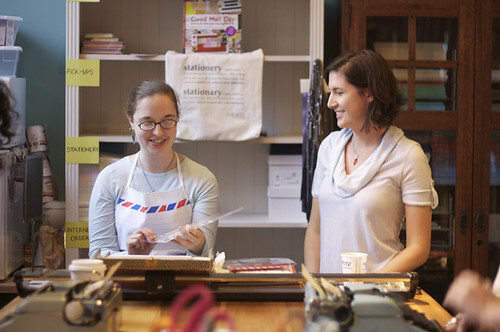 Thanks also to Chandra hosting the event in her shop Greer and for LWA member Isabel for being our event photographer. We had lots of fun talking about letters and typing along with all you, so much so we are planning a second event already. I've uploaded some photos from the day. Donovan illustrated special letterhead for the event. Inspired by old hotel stationery, she sketched the Greer store front for the header. We gave the stationery and special buttons out to everyone who attended and two lucky people left with extra-special giveaway prizes.We are planning on doing this event again in January, complete with cocktails! My boyfriend remarked the other day on how digital documents are designed to mimic real-world documents. For example, in Microsoft Word, when you type, your view is essentially that of an 8.5 X 11 piece of paper. 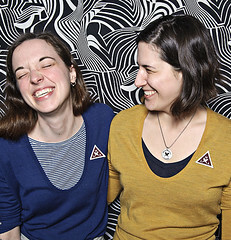 Anyway, I happened across this project today as I was rummaging through the archives over at Uppercase. It's an Olivetti Lettera 22 typewriter which has been rewired to communicate with a computer so that the typing writes an e-mail message and when the paper is removed from the typewriter, the e-mail is sent. This blows my mind. But I also think, what if you want to write more than one page or how do you make corrections? Still, it's totally rad project. Personally, I like the idea of a hard copy e-mail which could then be actually mailed. Hmmmm.... Maybe that can be a new fun download!